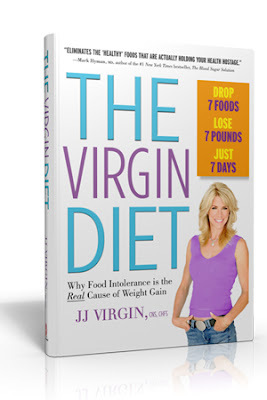 As I mentioned back in this post, I started reading The Virgin Diet a month or so ago and have decided to finally bite the bullet and try out the three week elimination diet. The premise of the diet is simple. For three weeks, or 21 days, you eliminate seven of the most common allergenic foods from your diet. After the 21 days is up, you reintroduce these foods one by one. By noting your body's reactions to each of the foods you can determine which foods you have a sensitivity towards. The book provides convincing research that explains why each of these foods are common allergens. The science behind how these foods may negatively affect your digestive system and body is laid out in terms that are easy for someone who knows nothing about science to understand. Like a Bill Nye for adults! Remember that guy? The book also provides specific recipes and exercises to incorporate into the 21-day plan for those who want to follow it to the letter. Eliminating the seven foods is enough of a challenge for me so I will not be using the recipes (i.e. the meal replacement shakes) or the exercise regimen. I will be sticking to my normal exercise routine and maintaining a normal diet that is absent the seven food groups listed above. The only food group I am not going to be super strict about is the added sugars. While I will not be eating any processed foods containing sugars such as HFCS, I am okay with sugars such as coconut nectar, agave nectar, honey and maple syrup. Obviously not going to be consuming anything artificial. As a recovered Splenda addict (I had multiple packets a day in college) I will never touch that yellow crack powder again. I'll share some of my days of meals along the way to give you guys an idea what it's like to eliminate these foods. The only one I'm really freaking out about is eggs because I kinda eat them a lot. Wish me luck!